Israel is a rogue terror state by any standard. No amount of speechmaking changes reality. They want supreme hegemonic regional control. They’re willing to wage genocidal wars to achieve objectives – including use of nuclear, chemical, biological and other banned weapons. Their Machiavellian extremism threatens world peace and stability. Netanyahu is the tip of the iceberg. Netanyahu came to Washington to convince Congress, the US public and his own population about a nonexistent Iranian threat. He knows Iran threatens no one. Its nuclear program is peaceful. It has no military component. His own Mossad says so. So does US intelligence annually. Claiming an existential Iranian threat is a ruse – a Big Lie. None exists. Netanyahu is a serial liar. He wants pro-Western stooge governance replacing Iranian sovereign independence. He’s willing to massacre millions of Iranians to rule the region unchallenged. His madness could launch nuclear war. At the same time, his goon squads terrorize Palestinians daily. Every day is Kristallnacht in Palestine. So-called Israeli security forces terrorize Palestinians with impunity. So do radicalized settlers with full state support and encouragement. Gaza remains lawlessly besieged. An Israeli caused humanitarian disaster worsens daily. West Bank and East Jerusalem Palestinian communities are virtual war zones – subjected to daily terrorizing incursions. Fear is pervasive. Collective punishment is official Israeli policy. So is institutionalized racism worse than anything experienced in apartheid South Africa. Peaceful public demonstrations are brutally attacked. Free expression and movement are prohibited. Population centers are isolated. Borders are closed. Militarized occupation prohibits normal daily life. Palestinians face rascist discrimination, land theft, bulldozed homes, regular terror attacks, targeted killings, mass arrests, wrongful imprisonments, torture, punitive taxes, impoverishment, indentured servitude, ethnic cleansing and slow-motion genocide. Palestinians wanting to live free on their own land in their own country are called terrorists. Fishermen are attacked at sea. So are farmers working their land. Their crops, livestock and orchards are lawlessly destroyed. Israeli goon squads shoot Palestinian children for target practice. Fundamental civil and human rights are denied. Few services are provided. Vital ones are lacking or inadequate. Palestinian lawmakers are imprisoned for belonging to the wrong party. Israeli democracy is pure fantasy. None whatever exists. When Israelis vote on March 17, embedded power will emerge victorious. Business as usual will continue. The whole world knows. Western leaders able to change things sit on their hands and do nothing. Washington funds Israel’s killing machine with billions of dollars annually, the latest weapons and technology, and bipartisan endorsement of its worst crimes. Before Netanyahu left for Washington, Israel cut off power for hundreds of thousands of Palestinians twice in the dead of winter. It warned about further outages if PA officials don’t pay millions of dollars in outstanding debt. Impossible because Israel won’t release around $250 million in tax revenues belonging to Palestine – collective punishment for joining the International Criminal Court (ICC). Israel punitively opened dams near Gaza’s border. Flooding caused hundreds of Palestinians to flee water levels more than three meters deep. Many others were affected – compounding the humanitarian disaster from Israel’s summer war. Media scoundrels ignore a catastrophe affecting hundreds of thousands of Palestinians on their own with virtually no promised aid delivered. While Netanyahu ranted to Congress, his goon squads destroyed thousands of acres of wheat, barley and other Bedouin Rakhama village crops. Area bedouins were given land to compensate for forced 1954 displacement. Israeli agreements aren’t worth the paper they’re written on. Bedouins live in so-called unrecognized villages – without essential services Israel refuses to provide. It wants Arabs displaced for exclusive Jewish development. It uses various means to remove them – including declaring privately owned Palestinian land closed military zones. On Tuesday, radicalized settlers attacked Palestinian MK Hanin Zoabi. She was speaking at Ramat Gan college near Tel Aviv. Lunatic Israelis attacked her with bottles and milk spilled on her. She sustained moderate injuries. Reports indicated Israel’s extremist right-wing ordered the attack. Without security intervention, she could have been killed. On March 17, she’s running for reelection. On February 18, Israel’s High Court overturned a right-wing Knesset ruling disqualifying her from general elections. She’s condemned for participating in the May 2010 Mavi Marmara humanitarian Gaza mission. Israeli fascists call her a traitor for supporting right over wrong. 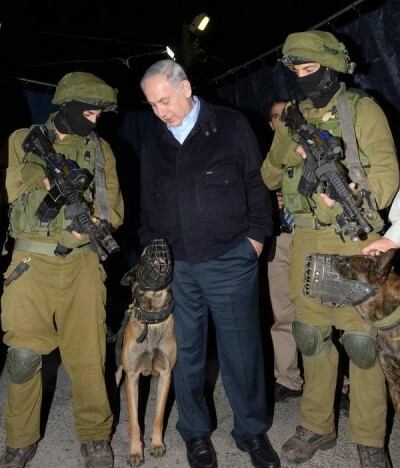 Israeli goon squads routinely use vicious attack dogs against unarmed defenseless Palestinian civilians. So-called Israeli inquiries are whitewashes by any standard. B’Tselem “documented and publicized this incident about two months ago,” it said. Video evidence reveals “standard” IDF practice. Attack dogs are unleashed. They’re ordered against Palestinians. They savagely bite into human flesh until handlers order release. Sometimes dogs maintain killer grips, said B’Tselem. Handlers have to taser them to release victims. Previous responses to B’Tselem complaints indicate so-called inquiries focus “only on how the dogs were used, and not on whether they should have been used at all,” the organization said. Israel continues numerous terror tactics against Palestinians no just society would tolerate. The incident in question occurred on December 23, 2014. Palestinians threw stones in response to a confrontation Israeli soldiers initiated. An eyewitness said they unleashed attack dogs on Palestinian youths. One dog savagely bit 16-year-old Hamzeh Abu Hashem. He required hospitalization. His family said he was arrested, handcuffed, removed from the hospital and taken to Ofer Prison. B’Tselem said he was sentenced to six months imprisonment. Similar incidents occur often. Israel uses killer attack dogs as terrorizing weapons against Palestinians for virtually any reason or none at all. Netanyahu’s congressional rant didn’t explain. Supportive House and Senate members didn’t ask. Or express any outrage against Israeli viciousness. One rogue state supports another.